All-new, thrilling and exciting concept of extra wide, short and thin freeride boards within the JP line. It features so far unseen early planing with the easiest jibing possible. The main difference to comparable boards from our competition is, that they really give you an electrifying feel which you normally only get from much smaller boards. Their early planing and top speed is also unmatched in their class. 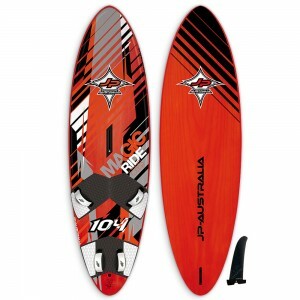 New Shape: Shaper Werner Gnigler took a lot of features from the Freestyle Wave boards. The thin rails in combination with the low overall thickness make them such outstanding easy jibers. They pretty much jibe by themselves. Push the rail and they will carve the same radius every time - nice and easy. Obviously, the thin rails also provide great grip for more sporty jibes – in case you are up for those. If your jibes are not perfect yet and you sometimes make little mistakes during the maneuver – no problem the Magic Rides will simply finish the jibe for you by keeping the same radius.